The Paperboy Blu-ray Review The Paperboy is a film that you will be thinking and talking about for many hours if not weeks after watching. For casual movie watchers it may not be the easiest way to kill to hours. For serious movie lovers, this film should not be missed. The Paperboy is a sweaty sixties pulp styled story set in South Florida. The feature is based on the critically acclaimed book by Pete Dexter and directed by Lee Daniels (Precious, 2009). Ward Jensen (Mathew McConaughey) and his brother Jack (Zac Efron) are hired by the overtly sexual southern belle Charlotte Bless (Nicole Kidman) to prove the innocence of death row inmate Hilary Van Wetter (John Cusack). Van Wetter, whom Charlotte plans to marry upon his hopeful release, is on trial for the murder of the local Sherriff. Along with Ward’s writing partner Yardley Acheman (David Oyelowo) they try to prove Hilary’s innocence through the investigation of the local authorities and interrogating Van Wetter himself. Much of the talk regarding this film has been over Nicole Kidman’s performance as Charlotte Bless and for good reason. The actress puts forward a very bold and memorable turn that will shine brightly next to her already impressive career. More akin to her work in Gus Van Sant’s To Die For (1995) than more recent roles, she pouts, teases and burns through the screen for the duration of the film. Cusack is in fine form and is creepier than ever as Van Wetter. His performance is offputtingly, vile and concentrated. It is also his finest work in well over a decade. McConaughey has another layered and charismatic performance to add to his resume. Oyelowo (recently seen in Jack Reacher, 2012) is also great in his supporting role and proves that we should be seeing more of him on screen in the future. Despite the doubters and his teen dream legacy, Efron does very well with the character of Jack. He conveys the desperation and loneliness within the character all the while looking very much the part. Jack’s relationship with the family maid Anita (played well by singer Macy Gray) is a lovely subplot that also enhances the main narrative. A film has many parts other than the actors that help it become a cohesive experience. With Paperboy some of these other parts are what keep it from being truly special. There are stages of the film where the tension is inconsistent and the tone uncertain. This gives the viewing experience a staggered feel at times as the film cuts between character plots and the main storyline. However, the sun soaked cinematography during the day, combined with the damp, desperate feel of the nighttime scenes, really help to evoke the films mood and also tie scenes together. 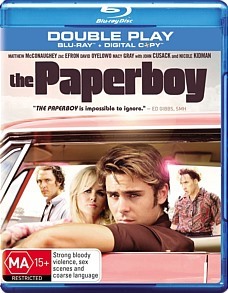 The Paperboy will divide audiences. Some will find it over the top and pointless, while others will revel in the pulp style and intensity of the characters on show. After viewing this film one thing is for certain: The Paperboy is a film that you will be thinking and talking about for many hours if not weeks after watching. For casual movie watchers it may not be the easiest way to kill to hours. For serious movie lovers, this film should not be missed.